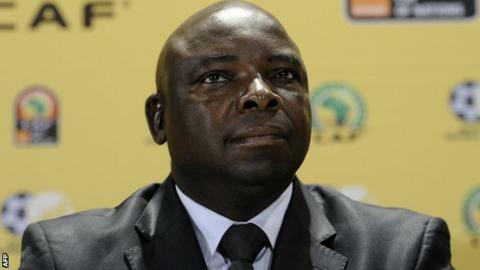 With the 2013 Africa Cup of Nations just a matter of months away, football bosses in South Africa have expressed concern at an increase in incidents of hooliganism. The eyes of the world will focus on South Africa when it hosts the Cup of Nations, which is why the president of the South African Football Association (Safa) is calling for urgent action. Kirsten Nematandani wants the authorities to get tough with the hooligans, and is demanding life bans for those found to have been involved. He said: "Most people go to watch soccer as a source of entertainment with their families, and they need to be protected from these thugs." Nematandani noted a number of incidents of late. The most recent of these occurred on Sunday, when Mamelodi Sundowns supporters tore down barriers and knocked down the club dugout, in protest over a 2-0 loss to Moroka Swallows at Dobsonville Stadium. The Safa boss said: "We can't allow people to take the law into their own hands, because by so doing they are destroying the 2010 legacy. "These unpleasant images are viewed across the globe. They are denting the image of football in the country, hence we say no to hooliganism." Nematandani urged clubs and the league to stamp out the rise in football-related violence by educating their supporters. He also recommended clubs identify the perpetrators and for the authorities to then hand out the harshest punishment. "The league should go through all available footage and ban for life those involved in such dangerous and unruly behaviour. We should root out this evil before it becomes a monster," he said. The South African Football Coaches Association (Safca), a body that looks after the interest and well-being of both professional and amateur coaches, has joined in the chorus of condemnation. "Safca is disturbed by the growing trend of attacks on coaches by supporters," said interim president, Gregory Mashilo. "As a responsible organisation with the interest of football at heart, we condemn the attack on coaches in general and in particular the consistent attacks on Mamelodi Sundowns coach, Johan Neeskens, by the club's supporters." Mashilo added: "Supporters are a vital component of our football construct. "We urge them to act in a responsible manner when dealing with challenges of any kind. It is wrong and unacceptable for the supporters to take the law into their own hands."